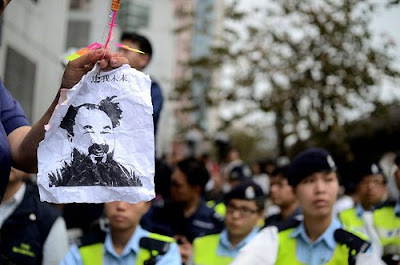 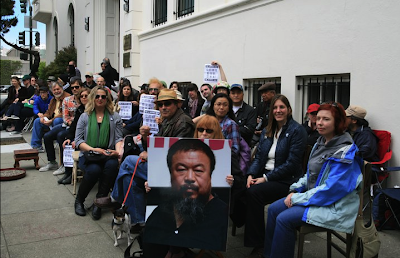 A thousand people in Toronto, 200 in Berlin, a "few hundred" in New York, smaller gatherings in other cities: On Sunday, thousands of activists showed up at Chinese embassies and consulates around the world to protest China's detention of artist Ai Weiwei 15 days ago. 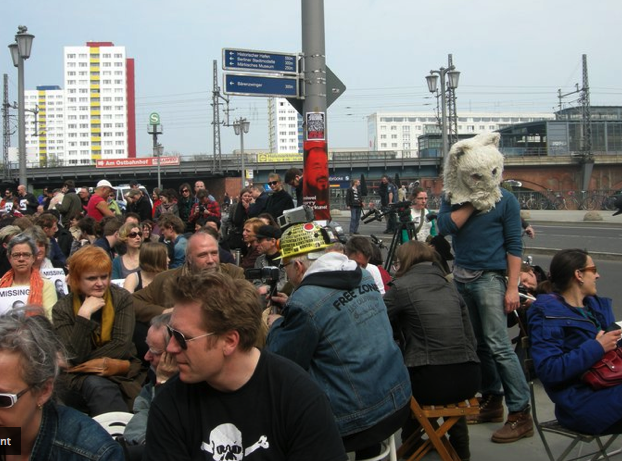 1001 Chairs for Ai Weiwei events took place Dublin, Munich, London, Stockholm, Tallinn (Estonia), Hong Kong (video), Los Angeles, New York (here's Jerry Salz at that protest wearing Rikrit Tiravanija's "Fear Eats the Soul" t-shirt), and elsewhere. The peaceful protests were inspired by Ai's 2007 Documenta installation 1001 Qing Dynasty Wooden Chairs. 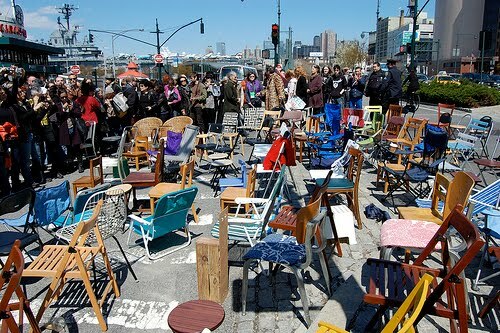 While that work was exhibited in an orderly grid without occupants in each chair, yesterday's demonstrations were decidedly more chaotic: Instead of ordered rows of nearly identical chairs, these ones appear hastily arranged on sidewalks and filled with people of all stripes, there to bear witness against injustice. 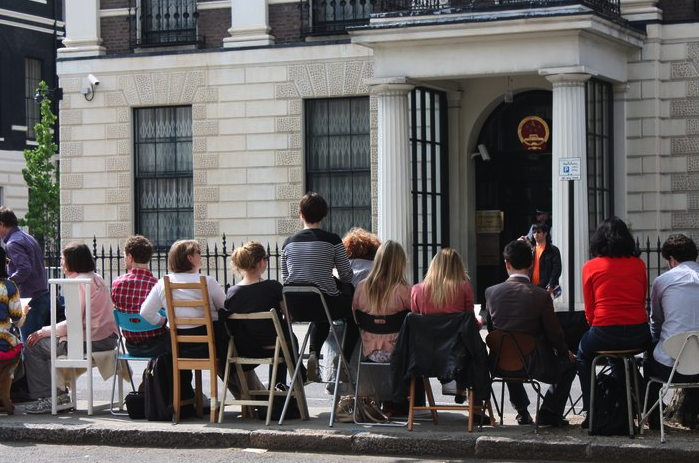 As much as I'm struck by those who filled chairs yesterday (thanks! 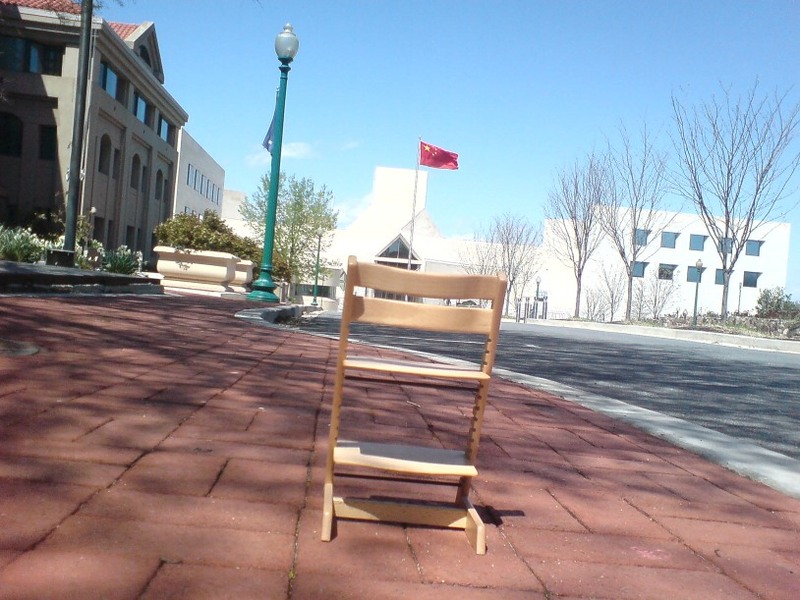 ), I'm also moved by the poignance of a single empty chair -- the one that should be filled by Ai, perhaps. 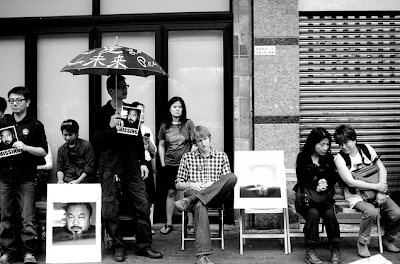 But then I think of Ai's piece in Basel and I'm reminded that those 1001 seats also represent the many other artists, journalists, bloggers and human rights activists who have disappeared in China in recent months and years. 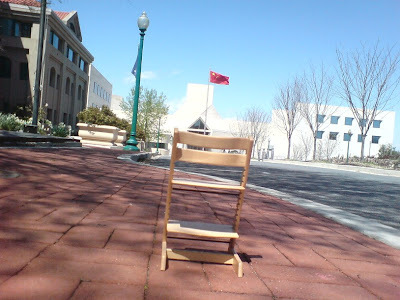 Let's keep a chair saved for them: Guo Gai, Liu Xiaoyuan, Liu Zhenggang, Wen Tao, Ms Hu, Xiao Pang, Liu Xiabo, Huang Xiang, Zhui Hun, Cheng Li and countless others.